Tag line: "WITH PETER LORRE - BORIS KARLOFF - BELA LUGOSI (THE HA-HA HORROR BOYS THEMSELVES!)" By now, I’m guessing it’s obvious I love old-time horror, and am especially fond of movies starring either Bela Lugosi or Boris Karloff (the titans of black and white terror). So, when I learned both actors appeared in 1940’s You’ll Find Out, a film that also featured the great Peter Lorre, I simply couldn’t wait to see it. 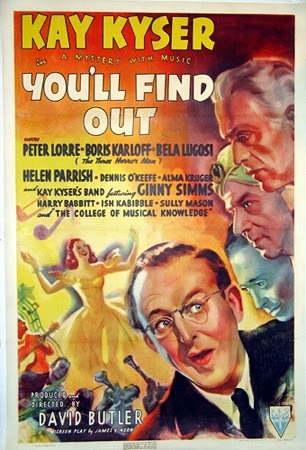 Bandleader Kay Kyser (playing himself), whose weekly radio program “The Kollege of Musical Knowledge” is listened to by millions, has agreed to perform at the 21st birthday party of socialite Janis Bellacrest (Helen Parrish), who just so happens to be dating Kay's manager and good friend Chuck (Dennis O’Keefe). But shortly after he and his band arrive at the Bellacrest Estate, a spooky mansion situated in the middle of nowhere that Janis shares with her Aunt Margo (Alma Kruger), Kay discovers someone is trying to kill Janis, though he has no idea who it might be. The prime suspect is a medium named Prince Sakano (Lugosi), who’s already bilked Aunt Margo out of a small fortune. Under the watchful eye of Judge Spencer Mainwaring (Karloff), the Bellacrest family attorney, and aided by Professor Carl Fenninger (Lorre), Kay and Chuck attempt to prove that Prince Sakano is a fraud. But is he actually the guilty party, or is someone else looking to bump Janis off? And if so, why? Karloff, Lugosi and Lorre all make their presence known in You’ll Find Out, each playing a character with something to hide (Lorre is particularly menacing as the Professor, whose friendly demeanor masks a truly sinister personality). But before you fans of classic horror rush out to buy this movie, keep in mind all three actors are relegated to supporting roles, and that You’ll Find Out is actually a showcase for Kay Kyser and his band, who get to perform a handful of musical numbers (one of which, “I’d Know You Anywhere”, was nominated for Best Song at that year’s Oscars). Unfortunately, the movie suffers as a result; aside from the fact the nebbish Kyser makes for an unconvincing hero, the film’s musical interludes range from bland (unlike the Academy, I wasn’t a fan of “I’d Know You Anywhere”) to downright unbearable (“The Bad Humor Man” was so amazingly annoying that I contemplated hitting the “MUTE” button until it was over). Aside from a few good scenes (the séance sequence is creepy as hell), and despite the best efforts of three horror veterans, You’ll Find Out never amounts to much, and in the end is, at best, a mediocre motion picture.